LIFELINE Foundation Support Team, Inc. invites everyone to take part in one of the biggest running events in the South of Metro Manila this summer - RUN4LIFE 2011 on May 15, 2011 at Filinvest Westgate, Alabang. Run for a cause. 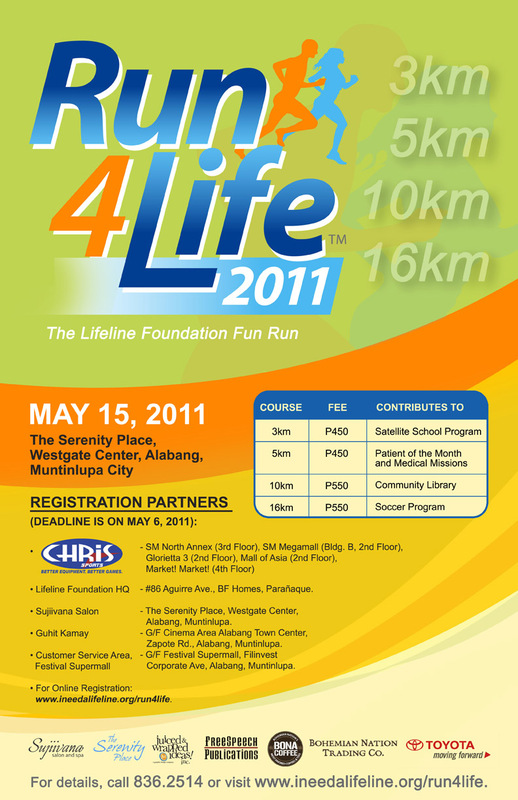 Registration is up until May 6, 2011. 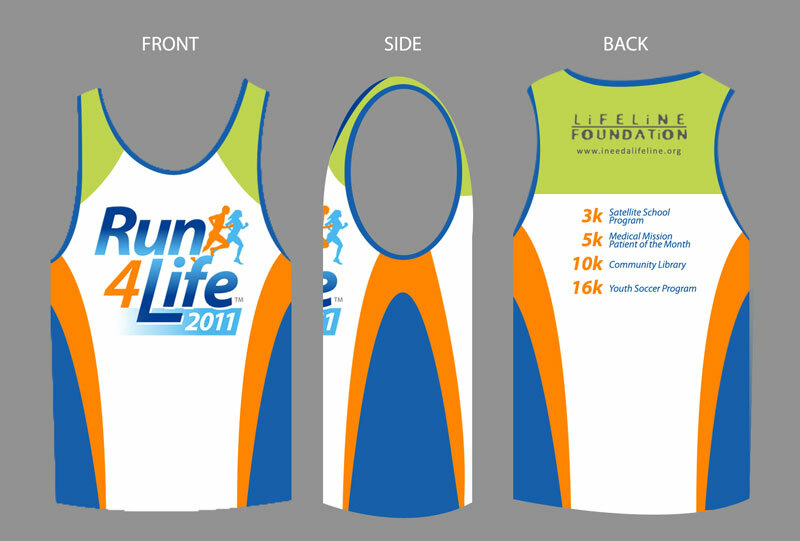 Help us support this project toward the betterment of people’s lives by participating in RUN4LIFE 2011 RUN FOR A CAUSE. There will be four legs in the run: 3k, 5k, 10k, and 16k. The race is open to everyone: young and old, beginners and experts, enthusiasts and supporters, individuals and groups. Let’s join hands helping change lives and inspiring our youth. * Fee is inclusive of singlet and race number. 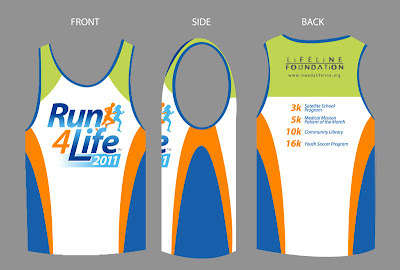 * Singlet availability is subject to a first register, first serve basis. but no guarantee on the availability of race kits. LIFELINE Foundation Support Team, Inc. is a non-stock, non-profit organization made up of doctors, nurses, dentists, educators, musicians, engineers, counsellors, graphic artists and writers who are all friends living in the city of Manila, dedicated to the relief of the oppressed and the empowering of the victim-minded. They began with a suicide prevention hot-line in 2003, and within the same year started giving free medical, dental assistance, along with free food and groceries, clothes and blankets to several Mangyan tribes of Mindoro. As Filipinos they began to sense a greater call to a global responsibility to the human need. They were proud to send a mission in December 2005 to war-torn Rwanda in Africa - third world helping third world, proving they have a lot to give. Since then, the foundation has given birth to several initiatives to help empower and change people’s lives: Medical & Wellness Outreach Missions to different barangays and municipalities in the Metro extending up to the provinces providing free medical consultations and medicines to several hundred policemen, firefighters, tanods, barangay workers, traffic enforcers, sanitation workers and their families; Patient of the Month program, where they sponsor surgery, therapy or other treatments to people who cannot afford it, to restore them to productivity once more; Animal Welfare school tours; Satellite School program for the underprivileged children of Barangay BF, Adoption Advocacy, Prison Cottage Industries, and many more.